Marine Cargo Insurance covers goods that have been sold and are being shipped to a buyer through different modes of transportation. What types of coverage are available? What is the basis of valuation of the sum insured under a marine cargo policy? The conditions of sale between the seller and buyer affect the basis of valuation. Sales are usually on either a FOB (free on board), C & F (cost and freight) or CIF (cost, insurance and freight); and taking these into consideration cargo insurance is usually provided for an agreed value. What is the period of insurance under cargo insurance? Cargo insurance is usually provided by a voyage policy. What is the coverage provided by a workmen's compensation insurance policy? This policy covers employers' liability towards their employees to pay benefits to employees injured, or killed in the course of or arising out of their employment, as stipulated in Articles 59 and 60 of the Labour Law of the State of Qatar. What type of property does the policy cover? Private Property which includes private households and their contents. Commercial or Business Property which includes buildings, machinery, plants and stock. What coverages are available for Private Property? This type of property is provided by a householder's Comprehensive Insurance Policy which combines protection for the house and its contents and covers damage from fire and other perils sush as: explosion, natural perils, impact damage, burglary, loss of rent, public liability, etc. What coverages are available for Commercial or Business Property? Commercial or Business property may require wider coverage than what is provided by the Standard Fire Insurance Policy and the Allied or Additional Perils. Various types of All Risks Insurance policies are available, which provide protection against a range of losses (although there are still important exclusions). This is a very highly specialized type of insurance which provides coverage for contractors engaged in building infrastructural projects such as roads, residential and commercial complexes, ports, tunnels power stations, etc. What does a Fidelity Guarantee Insurance policy cover? This policy provides reimbursements to employers for losses caused by dishonest or fraudulent acts of employees. Earlier in the Takaful section it was mentioned that the Aman Investment & Savings Program is an insurance & investment Plan in one. How does this work? The following example shows how the insurance & investment processes work together in parallel in one plan. Monthly contribution (insurance premium) QR. 1 000 comprising: QR. 53 being the part of the premium covering death and disability, under the "AMAN" Life policy; QR. 947 being the investment amount. In addition Mohammed was entitled to annual cash dividends on the AMAN (Life) contribution (18% in 2007). QllC pays to the policyholder (in case of disability) or his/her heirs or beneficiary named in the policy (in case of death) the unpaid contributions (premium) of the Sum Insured plus the amount of contributions (premiums) that were actually made, together with the investment profits on them up to the date of death. 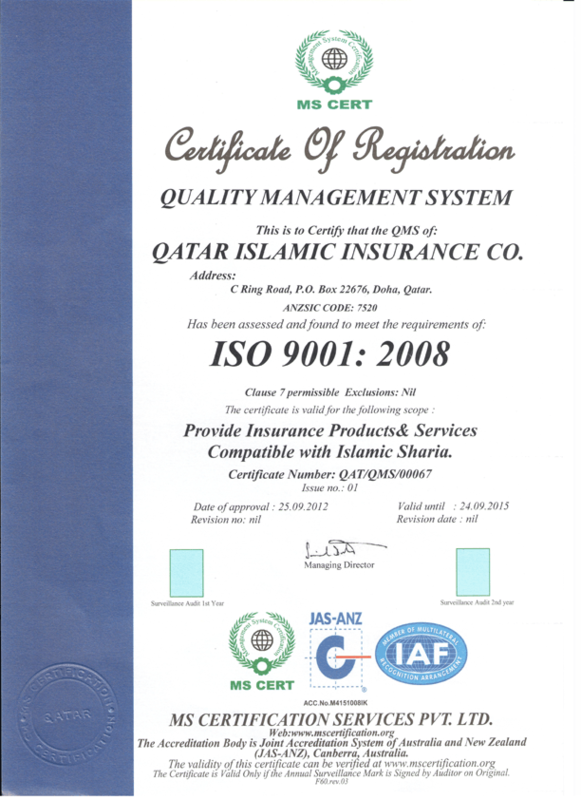 © 2015 Qatar Islamic Insurance All rights are reserved.